Vi Godfrey Carr began her theatrical career as a baby and it almost ended during the Second World War when she lay across an unexploded bomb, in the wreckage of a cinema. In this fascinating memoir, she recalls life in the Portable and Fit Up theatres – travelling companies which, in the days before cinema and television, took entertainment to the rural areas. Her mother, a Northumbrian girl with a beautiful voice, ran away to London and married George Austin Knox, member of an old theatrical family. In the 1890’s the Austins started their own Portable Theatre in Durham which they took, with great success, to mining communities all over the North east. As well as acting, troupers had to sing, dance, play instruments, change scenery and care for the horses which provided the transport. Vi married another popular entertainer, Will Godfrey, and for many years they acted together. During the war, they were with ENSA, the organisation which provided entertainment for the troops, playing while bombs fell in Birmingham and Coventry. Finally, they returned to Ushaw Moor, Co. Durham. She has contributed too many television and radio programmes. From a book “From portable Days” by Violet Godfrey Carr – A Personal Account of Life in the Theatre as told to Neil McNicholas. ### Anyone remember the Portable Theatre, hard to imagine with the entertainment of now, this must have been such a thrill for the hard working miners of the time. I managed to get a copy of this book,,, very interesting,, available on Amazon. Wilf Bells article on Insurance agents in the village and Alf Rothwells reply got me thinking who our Insurance man was and I cannot remember. However I can remember the collector who used to call for our Medical Fees. This was before the founding of the National Health Service in 1948 when medical care became free to all. Prior to that medical care had to be paid for. The man that collected from my home was a Mr. Foster who lived in Hall Avenue. Our doctor was Dr. Dickison whose surgery was in a front room near the top of Arthur Street. He was a great man and always had a cigarette in his mouth, even in the surgery. He wore round 1930s style glasses, a pin striped suit, usually brown and always wore a Homburg style hat. My mother tells me that he visited our house at 29 Harvey Street, New Brancepeth the day I was to be baptised at St. Josephs church at Ushaw Moor. My mother was torn between the names Anthony and Terence and could not make up her mind which name to choose. Dr. Dickison suggested I was named Brian after his son and so I got my name from Dr. Dickisons suggestion. I am off at a tangent again. Another caller at our house was Mr. Wilson from Bearpark Colliery. He was the collecting agent for Doggarts Store which was situated in the Market Place in Durham. I think it is now Boots the Chemists. I can only remember Doggarts selling clothing but I stand to be corrected. Mr Wilson was the Dad of Betty Wilson who became a teacher at St. Josephs at the same time as Joyce Quinn arrived at the School. This must have been in the late forties. I have gone off at a tangent fron Insurance agents in the village but I hope my memories jog a few more memories and they end up on the Web Site. Mr Welsh or Dickie Welsh as he was better known was the Council Rent Collector and lived in Whitehouse Court next to Tom Gibb. Does he jog anyones memory? There were two very quick replies to my article on coal lying in the street. It was good to see that Peter Clark and Wilf Bell enjoyed the article. I haven’t seen Peter for well over 50 years. That sounds morbid but time flies by so rapidly. Another vivid memory regarding coal was the never ending run of clapped out lorries carrying coal from opencast sites further up the valley to the washery and coal dump which were situated on the right hand side of the road about 300 yards from Relly Bridge. These wagons were mostly ex War Department vehicles even down to the bull bars fixed on the front of the radiators of the flat fronted lorries. I think they were Bedfords. You can see them in footage from the Second World War. Back to the coal. These lorries would not be allowed on our roads today as most were grossly overloaded with coal piled up behind the boards which had been fitted on to the original body work to give the lorry a greater carrying capacity. There were no road markings at that time at the crossroads outside the Flass. 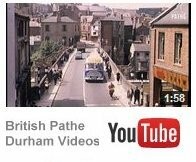 The drivers would slow the lorries right down as they neared the junction from the direction of Esh Winning, then with a grinding of gears and the lorries swaying with the camber of the road and the bank they would crawl across the junction and into Durham Road. The crossroads were covered in coal and coal dust as the loose coal which fell from the lorries was ground into dust by the traffic using the crossroads. There was always an inch or two of fine coal and dust in the gutters at the sides of the road. My first memory of open cast mining was on the farm of Mr. Stephenson on the right hand side of the road between Ushaw Moor and Broompark. That would be 1946 or 1947. Correct me please if I have the dates wrong. Happy carefree days before starting work and then conscription into the Armed Forces. One of the firms hauling the coal was Hunters Bros. from Tantobie. Can anyone remember the names of the other firms hauling the coal. A sight which has long since disappeared from the streets of Ushaw Moor is that of loads of coal lying on the road waiting to be carried in and hoyed into the coal house. Men employed at the pit received a quantity of coal free for domestic use. My first memories of coal being tipped was when our family lived at 29 Harvey Street at New Brancepeth. Across the back steet was a home made wooden coal house next to the gable end of the netty. On arriving at Ushaw Moor in January 1947 the coal house was situated next to the outhouse. If it rained when the coal was lying on the road waiting to be “put in” to the coal house it was very heavy to carry and the coal acted as a dam and the water built up behind the coal. New Brancepeth Colliery coal was delivered by lorry, Tot Sheivels was the driver. I can remember that coals was from Ushaw Colliery at one time was delivered by horse and a two wheeled cart. The coalman lived in Durham Road. All heating at this time was coal fired. This was long before central heating and the (recent?) arrival of natural gas into the valley I cannot recall the weight of free coal alloted to each worker and I would also query my use of the word free as colliery owners were not renowned for their generosity to their workmen. In the summer months the coal house was always full but in the winter months the coal house could be half empty. The coal was usally carried off the street and into the coalhouse in buckets. Wooden boards were placed across the front of the coalhouse so the coal could build up behind the boards and there was a gap at the bottom of the boards to push the shovel in to this gap and retrieve the coal and put it into a bucket. On winter evenings two buckets of coal were filled before darkness fell and were ready for use during the evening. Toast never tasted so good as when it was toasted on the toasting fork in front of the coal fire. I can still taste it. Coal was also supplied by coalmen to homes where no one was employed at the Colliery. Rowlands Bros. whose garage was situted at the top of Unthank Terrace at New Brancepeth was one and another coalman was Mr. Grady from Cornsay Colliery. Brian Mc. A Date With Destiny 2010? By all accounts Durham Cathedral did Sir Bobby Robson well and that is great to hear. Now then what about a five a side charity ‘grudge’ match in honour of Sir Bobby – between the 1959 Ushaw Moor County and Waterhouses Modern teams? By their nature these things do not happen by themselves so I expect I will have to put some input into it. The venue? What about that great facility at the current Ushaw Moor school -which I believe Sir Bobby opened or at least visited. It could be fun with a significent tinge of rivalry – oh yes rivalry as you have never seen it. Alf and Brian might even turn up [or more] to witness another drubbing for Waterhouses, or more likely, a very close encounter. You can see that the edge is still there. John Weir against the spent sliding tackle specialist could be interesting.On the other hand does David Gerrard remain the better of the two keepers these days? There are so many questions that need to be answered, and so much raw rivalry to extinquish – with a beer or two! Leave it to me. Google – UFO Ushaw Moor – and read the report for yourself! Alternatively a more complicated way of finding it is to feed in www.ufodigest.com and then put – Ushaw Moor – into the search box top left of the site itself. I would not lose any sleep over it but there again I could go to sleep in a cold boring churchyard at night without too much of a problem. Then the two ‘little uns – twins – Norman Hope and Doreen Hope. Finally at the bottom Jennie and Vera Bainbridge. The photograph must have been taken in c1939. If you can recall any of the magnificent seven by all means share your memories on this site. You can enlarge the photo by clicking the mouse on it. Photograph courtesy of Valerie Bainbridge and the necessary ‘magic’ to scan and place it in front of you -provided by my son David.